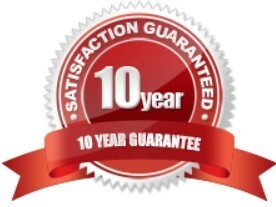 Firstly we will carry out a free feasibility survey where measurements will be taken and your requirements discussed. Our surveyor will discuss the different design and layout opportunities available for your property. It will then be assessed whether planning permission is required. 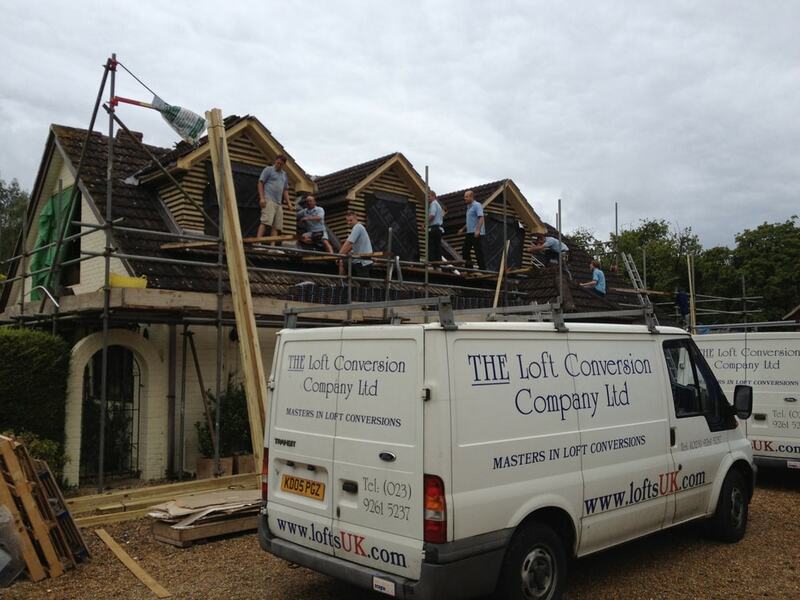 If so, then a good external design for your loft conversion is necessary so that permission will be granted. Large flat roof dormers are always allowed to the rear elevation (as this is Permitted Development, see next paragraph) and smaller pitched roof dormers are usually allowed to the front elevation. However, Velux window(s) to the front may be a better option as planning permission will not be required. Most loft conversions do not require planning permission. For instance, if the design does not extend outside the roof more than 50 cubic metres for a detached house and 40 cubic metres for a terraced house. This is referred to as Permitted Development. 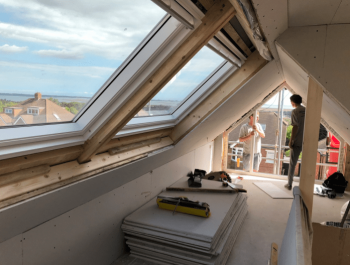 Velux roof windows do not require planning permission to the front and rear elevations. This includes the Cabrio balcony system (depending on your area) but certainly does not include the Velux Roof Terrace, which always requires planning permission. Velux windows to the side elevations will need to be installed 1.7 metres from the floor level to the window cill. Dormers or a Gable Wall constructed away from the front elevation is permitted development . However, if you live in a conservation area, listed building, national park, flat or maisonette then planning permission will always be required. Our experienced surveyor will advise you if a planning application is necessary. Please note that the front elevation is sometimes referred to as the Principle Elevation. 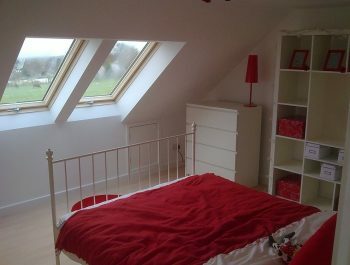 All loft conversions require Building Regulations approval. We apply for this during the preliminary stages, submitting Architectural drawings and detailed structural calculations for approval. During the works thorough inspections are carried out by a qualified Building Inspector. On completion a certificate is issued stating that all work has been carried out in accordance with current Building Regulations. 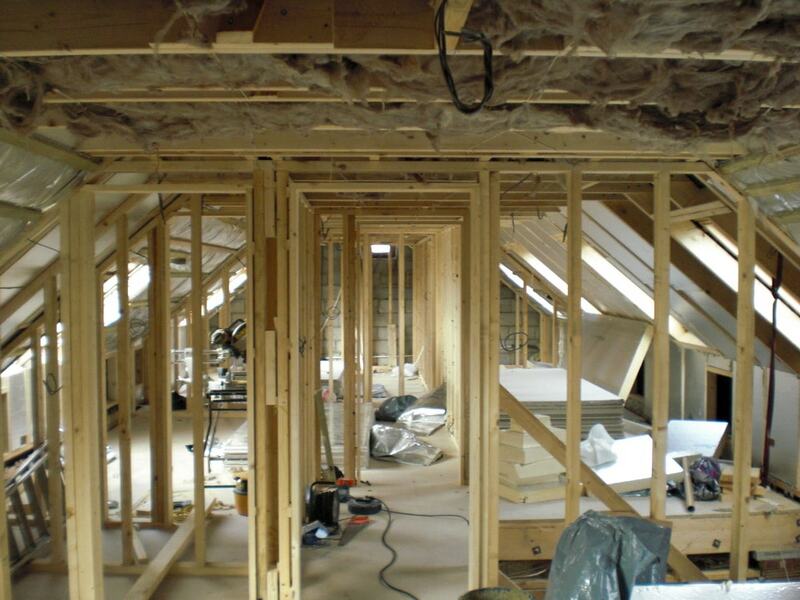 It is of the utmost importance that your loft conversion complies with Building Regulations and that it is formally approved before the work commences. We will arrange all inspections throughout the project. It is important not to have over ambitious floor space targets, for example, a walk in wardrobe and additional bedrooms. Proportionate bedrooms, en-suite bath/ shower rooms and landing areas will be an important factor in designing your loft conversion. A well planned and designed loft conversion will add approximately 30% living space to your house and 50% to your bungalow. Positioning the staircase correctly is one of the most important factors in the design. The new stairs are often installed above the existing staircase, which in our opinion is always the best place. This method connects the two staircases together, keeping the stairwells in the same area of the house. Matching handrails/ spindles and a good continuous flow from the ground floor to the new 2nd floor will make the conversion look part of the original build, and not just an add on. 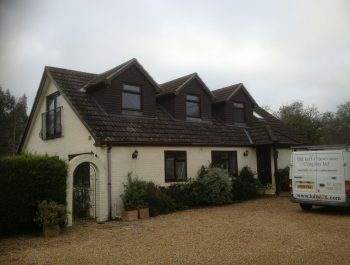 With bungalow conversions the best position for the staircase is usually near the front door. In some cases existing floor space from a room next to the new staircase will need to be sacrificed. This can be slightly off putting, however, this is only a last resort solution. When standing in the loft, if you cannot touch the top of the rafters then this generally means a loft conversion is suitable. If you can easily touch the top of the rafters (approximately 2.2 metres or less) then it might be too small to form a useful functioning bedroom. A dropped landing at the top of the new staircase or lowering the ceilings to the lower floor may be necessary to achieve the height required for Building Regulations. If the use is just for a play room or a study then all well & good, but beware, you may embark on a tight loft conversion only to realise that there is nowhere to place the bed. Our surveyor will take exact measurements and will advise you in more detail during your initial feasibility survey. For more guidance on the types of roof and approximate minimum head height required prior to planning your loft conversion visit our Types of Roof page. It is better to achieve one or two good sized functional rooms to compensate for the lack of head room in some areas of the conversion rather than trying to cram in the bedroom numbers for the sake of it. By doing this the new room(s) can become nothing more than single bedrooms with very little inbuilt amenity value. Adding an en-suite can boost the value of your property and add luxury to your bedroom. We’ve got ideas for getting the best out of your loft conversion, clever storage tricks and decorating tips to maximise the space. A flat roof dormer to the rear elevation and Velux roof light windows to the front is a very popular design for the exterior. However, we view each property as unique and will design the exterior suited to the property and the needs for the conversion. If the property is particularly wide then the flat roof dormer can be split into two or three smaller dormers with no more than 2 metres width to break up its bulk. If the roof is very large then a dormer may not be necessary and Velux windows can be used. However, to maximise the potential and if your budget allows it, we will explore the possibilities of strategically locating a dormer or two. This will often free up an extra 30% floor area that you may not have realised. Dormers are not the only design solution for more light and space. Consideration should also be given to a hip roof to a gable wall to the side elevation. 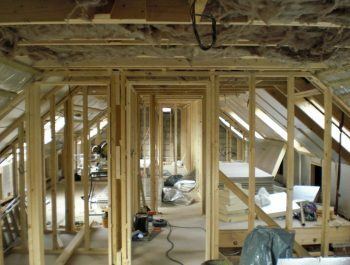 There are other issues to consider when planning your loft conversion which can be discussed in more detail during the initial feasibility survey. The previous points mentioned are the main ones relative when initially considering a loft conversion. 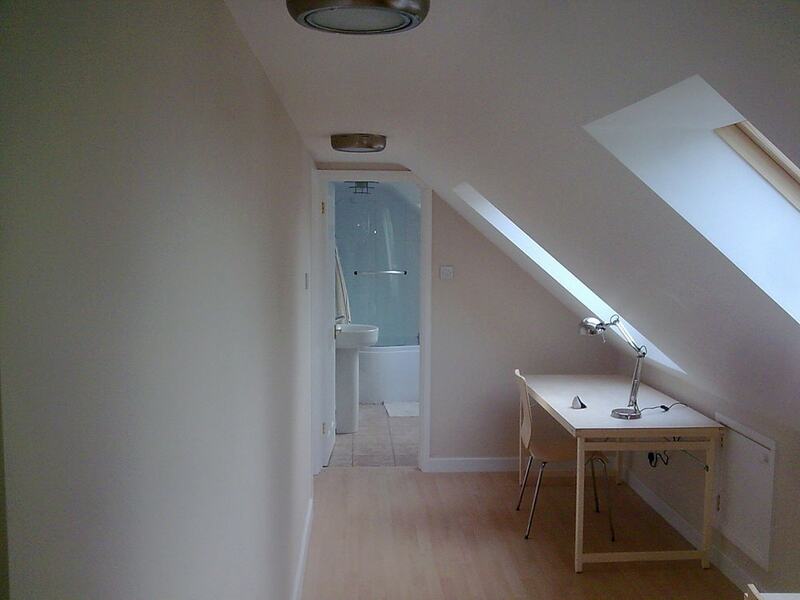 Once the assessment criteria is completed we mainly focus on one primary area- Designing Your Loft Conversion.